After installation, run the software and log in with your iolma username and password. If a newer version is available, in the upper right corner a message will ask you to restart the software. Just click the green RESTART button and wait - it will update and it will start again. In the Devices section, select the webcam to be used for the lesson as Webcam1. If you have more webcams attached to your computer, you can use them in the lesson by selecting them as Webcam2 and Webcam3. Set resolution to nHD[16:9] - 630x360. Select the desired microphone and system speakers (the headphones usually plug into the speakers output) - to ensure the lesson can take place, during the call please use hadphones, rather than the speakers. Leave the Call options and the Networking sections unchanged. After selecting the webcam(s), we recommend that you enable SELFVIEW (by default it is enabled). You should see yourself in the upper left corner of the call window. If you can't see yourself, or if the image is distorted, your webcam may be an older model and may not support the selected resolution. In this case you should go back to SETUP and select the VGA [4:3] - 640x480 resolution. If you'd like to connect a new webcam or USB headset to the computer, you should first close iolma Videocall, connect the respective device and then start again iolma Videocall. This way, iolma Videocall will detect the new device. If you selected more than one camera, you can switch between your cameras using the 1/2/3 keys on your keyboard. Switching will change the webcam from which you are sending images to the teacher. The active camera is highlighted with a green stripe. CONGRATULATIONS! IOLMA VIDEOCALL IS ALL SET! 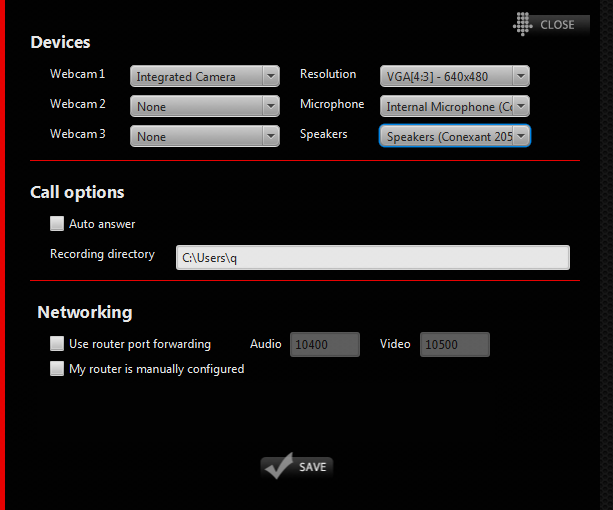 The SETUP menu allows you to configure all the peripherals as well as the call settings and the networking. The SETUP is to be configured BEFORE the call. See above for details on setting up the cameras and the sound peripherals. Remember that if you'd like to connect a new webcam or USB headset to the computer, you should first close iolma Videocall, connect the respective device and then start again iolma Videocall. This way, iolma Videocall will detect the new device. If you encounter problems, please refer to the TROUBLESHOOTING tab above. Checking "Auto answer" will start the call as soon as someone calls you, without asking you if you'd like to take the respective call. The software will attempt to automatically configure your router. If auto-configuration fails you will see a message in yellow. We advise you simply leave things as they are - leave "Use router port forwarding" uncheked. Only advanced users are recommended to attempt setting up manually the port forwarding. MUTE is a toggle button that will completely cut the sound the teacher receives from your microphone. SELFVIEW is a toggle button that activates/deactivates the image of yourself you see in the upper left corner. Enabling SELFVIEW is particularly useful in the setup stage, as not only it will allow you to make sure that the resolution of your webcam(s) is correctly configured, but it will also allow you to adjust the webcam(s) position, so that the teacher can get a meaningful image of yourself during the lesson. FULLSCREEN is a toggle button that activates/deactivates the full-screen viewing of the call. The QUALITY menu allows you to change the call quality in real time. 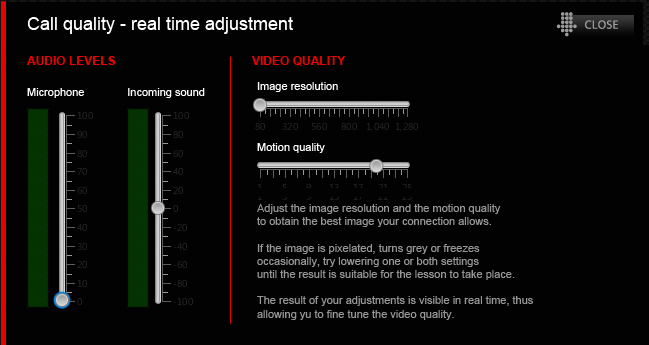 The Audio levels section allows you to change in real time the sound levels used during the call. Microphone represents your own microphone level. If the teacher can't hear you loud enough, you should turn the microphone up. Incoming sound is the volume at which you hear the teacher. If you can't hear the teacher loud enough, you should turn the Incoming sound up. The Video quality section allows you to adjust in real time the video parameters of the call, so that you can have the best experience possible. Image resolution adjusts the quality of the image you receive - the higher the resolution, the better the details. Motion quality adjusts the fluidity of the motion in the video you receive - the higher the motion quality, the more fluid the movements. If the images gets pixelated or you see grey areas where there's seemingly no motion, or if you see very choppy movement, it means the capacity of your network is limited (might be only temporarily so). You should lower the Image resolution, the Motion quality, or both, to work around such networking limitations. These two controls allow you to decide which is more important: the clarity of the picture or the fluidity of the motion, and to adjust the parameters accordingly. For example, if you prefer good clarity at the expense of motion fluidity, you can lower the Motion quality while leaving the Image resolution at a high level, and vice-versa, if you fluid motion is more important, you can lower the Image resolution and leave the Motion quality at a higher level. The CALL button brings up an interface allowing you to communicate with the teacher in your current lesson, as well as with the teacher in your next lesson. You will see the two lessons, and each of the two teachers' status is represented next to the name. If their status is active, you can call the respective teacher. The HANG UP button ends the current call. "Recordig directory" is the folder where the recorded lessons will be stored. If you're using iolma Studio hardware, please leave this parameter unchanged. For recording you should have sufficient storage space - consider that each recorded lesson can take around 1 GB of space. Teachers MUST set up port forwarding to make sure communication with the students is possible. The software will attempt to automatically configure your router. If auto-configuration fails you will see a message in yellow. If you are an advanced user, you can attempt to set up manually the port forwarding, and then input the port numbers in the respective fields. If auto-configuration fails (you get the yellow message) and you do not know how to set up port forwarding, you can request us to provide you with a step-by-step guide. RECORD isa toggle button that starts / stops the recording. VIEW CALL / VIEW MIX is a selector allowing you to see the call (the student) or the mix (the image as it is recorded). The button should always stay on "View call". Actually, "View mix" is just a preview, meant to allow you to make sure the recording looks correct, and if doesn't, to allow you to make the necessary adjustments in the studio (e.g. camera framing, etc). By selecting "View mix" will NOT see the actual recording, but rather just individual frames from it - you will see a choppy motion, but rest assured, the recording is absolutely fluid. The choppy motion is not a problem, but rather a feature to avoid supplementary workload for the processor. The selector is available even if you are not recording, so we advise you should check how everything looks before actually pressing "record". After you made sure the camera framing and everything else is alright, you should switch it back to "View call"
MUTE is a toggle button that will completely cut the sound the student receives from your microphone. Microphone represents your own microphone level. If the student can't hear you loud enough, you should turn the microphone up. Incoming sound is the volume at which you hear the student. If you can't hear the student loud enough, you should turn the Incoming sound up. The CALL button brings up an interface allowing you to communicate with the student in your current lesson, as well as with the student in your next lesson. You will see the two lessons, and each of the two students' status is represented next to the name. If their status is active, you can call the respective student. A headset is absolutely necessary. Also, a separate microphone may be necessary, because headset microphones or laptop microphones are unlikely to capture the sound of your instrument at an acceptable quality level. The bandwidth available for upload will dictate how good the teacher can see you. in other words, even if you have an HD webcam, a poor internet connection will never allow the teacher to see you in good quality. I can't see my webcam image. If the new resolution setting doesn't work, repeat selecting another value for the resolution. Typically, for older webcams, choose one of the options marked 4:3, while for newer webcams, try the 16:9 settings. Note that only high-end webcams support HD resolution, so the safer way is to select nHD resolution. I have more webcams: some of them look ok in the preview, while the image from the others is distorted. Try to identify a resolution setting that will work for all your webcams, as described in the question above. If you can't identify any resolution that will work for all your webcams, your only option is to select in Devices, under Webcam 1/2/3 only the ones that work at a certain resolution. For example, if you select HD resolution, but one of your webcams does not support HD, you either won't get an image from that webcam, or you will get a severely distorted blur instead of an actual image. Your internet connection doesn't permit communication via iolma Videocall (for example mobile broadband connections such as EDGE, 3G or 4G rarely allow direct communication). Try to use a different internet connection (for example, if you have a wired connection, plug it in). Typically, from the Call interface, you should be able to write to or call only the teacher (or student) for the current lesson and the teacher (or student) for your next lesson. You can do this only when the respective teacher (or student) is available (green status). If the status next to the teacher's (or student's) name is red or grey it means the teacher (or student) is busy or, respectively, offline. Click on QUALITY and turn up the "Incoming sound" volume. If this doesn't work, then end the call (Hang up), go to SETUP and make sure your Speakers device is correctly configured, and then resume the call. If this doesn't work either, then end the call and start a text chat to let the other person know that you can't hear him - the other person should make sure that Microphone is turned up in their call window. Let the other person know of this problem and ask the other person to end the call, lower the call quality in their call window and then call you again. Make sure MUTE is not pressed. Click on QUALITY and turn up the "Microphone" volume. If this doesn't work, then end the call (Hang up), go to SETUP and make sure your Microphone device is correctly configured, and then resume the call. The other person can't see me (no image, jittery image or fragmented image). End the call, go to SETUP, choose a lower setting for Resolution, and then call the other person again.